Film rights have been bought by Hey Day (the makers of "Harry Potter) together with Brad Grey (producer of "The Sopranos) and Brad Pitt in their first acquisition for Warner Bros.
Christopher John Francis Boone knows all the countries of the world and their capitals and every prime number up to 7,057. Although gifted with a superbly logical brain, Christopher is autistic. Everyday interactions and admonishments have little meaning for him. At fifteen, Christopher's carefully constructed world falls apart when he finds his neighbour's dog Wellington impaled on a garden fork, and he is initially blamed for the killing. Christopher decides that he will track down the real killer, and turns to his favourite fictional character, the impeccably logical Sherlock Holmes, for inspiration. But the investigation leads him down some unexpected paths and ultimately brings him face to face with the dissolution of his parents' marriage. As Christopher tries to deal with the crisis within his own family, the narrative draws readers into the workings of Christopher's mind. And herein lies the key to the brilliance of Mark Haddon's choice of narrator: The most wrenching of emotional moments are chronicled by a boy who cannot fathom emotions. The effect is dazzling, making for one of the freshest debut inyears: a comedy, a tearjerker, a mystery story, a novel of exceptional literary merit that is great fun to read. "From the Hardcover edition. Fifteen-year-old Christopher has a photographic memory. He understands maths. He understands science. What he can't understand are other human beings. 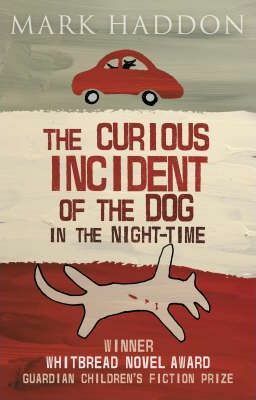 When he finds his neighbour's dog lying dead on the lawn, he decides to track down the killer and write a murder mystery about it. But what other mysteries will he end up uncovering? "A stroke of genius, as the advantages of having a naive, literal-minded boy in the driving seat are manifold . . . We do learn what it might feel like to have Asperger's Syndrome"
"The book gave me that rare, greedy feeling of: this is so good I want to read it all at once but I mustn't or it will be over too soon. Haddon pulls off something extraordinary . . ." -- "The Observer"
"Always surprising and often hilarious." -- "The Globe and Mail"
"One of the most affecting things I've read in years . . . it's brilliant." -- "The Guardian"
"Mark Haddon's new novel comes with glowing endorsements from Ian McEwan and Oliver Sacks . . . For once, the pundits speak the truth." -- "The Economist"
"A stark, funny and original first novel . . . [with] one of the strangest and most convincing characters in recent fiction." -- "The New York Times Book Review"
"Mark Haddon's portrayal of an emotionally disassociated mind is a superb achievement. He is a wise and bleakly funny writer with rare gifts of empathy." -- Ian McEwan, author of Atonement "From the Trade Paperback edition." " A finely crafted debut ... conveys an astonishing intensity of emotion, almost Proustian in its sense of loss and regret." "" The assurance with which Mary Lawson handles both reflection and violence makes her a writer to read and watch ... has a resonance at once witty and poignant." "" Crow Lake is the kind of book that keeps you reading well past midnight; you grieve when it' s over. Then you start pressing it on friends." "" A touching meditation on the power of loyalty and loss, on the ways in which we pay our debts and settle old scores, and on what it means to love, to accept, to succeed-- and to negotiate fate' s obstacle courses." "" Lawson' s tight focus on the emotional and moral effects of a drastic turn of events on a small human group has its closest contemporary analogue in the novels of Ian McEwan." " "From the Hardcover edition." "A finely crafted debut ... conveys an astonishing intensity of emotion, almost Proustian in its sense of loss and regret." ""The assurance with which Mary Lawson handles both reflection and violence makes her a writer to read and watch ... has a resonance at once witty and poignant." ""Crow Lake is the kind of book that keeps you reading well past midnight; you grieve when it's over. Then you start pressing it on friends." ""A touching meditation on the power of loyalty and loss, on the ways in which we pay our debts and settle old scores, and on what it means to love, to accept, to succeed--and to negotiate fate's obstacle courses." ""Lawson's tight focus on the emotional and moral effects of a drastic turn of events on a small human group has its closest contemporary analogue in the novels of Ian McEwan." " "From the Hardcover edition."